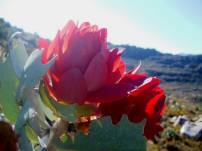 With its long history and good looks, Protea nitida is a gem in the fynbos world. It is the only Protea species to form large trees yielding usable timber. The waboom may vary in height. Generally, it is a gnarled, slow growing, 5m tall tree with white-grey bark and a trunk diameter of up to 400 mm. Under favourable conditions, however, it may attain a height of up to 10 m and a trunk diameter of 1 m. A multi-branched dwarf form with a rootstock and with narrower leaves occurs on the Cape Peninsula, Cape flats and Riversdale flats. Young crimson leaves give way to mature, bluish, sea-green leaves. Large, greenish white flower heads appear year-round with a peak from May to August. Many small fruits (usually referred to as seeds) with long straight hairs are released 9-12 months after flowering. The current status is "of least concern" (LC). In the past, though, thousands of trees were lost to overexploitation by bark stripping for the tannin and by extensive use of wood for charcoal. 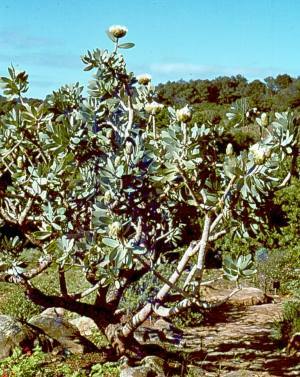 Protea nitida has a widespread distribution ranging from the Bokkeveld escarpment to the Cape Peninsula and the Winterhoek Mountains in the Eastern Cape. It occurs at altitudes of 0-1200 m above sea level and prefers drier, lower slopes, especially well-drained scree. An abundant population of P. nitida can form open woodlands. Carl Linnaeus, the father of taxonomy, named the genus Protea because he believed that the genus displayed great diversity. Proteus was the mythological Greek god who could see into the future and always spoke the truth, but in order to extract a prophecy, one had to grasp him tightly while he changed into numerous animate or inanimate forms. The specific epithet nitida, the Latin word for "shining", apparently refers to the appearance of the leaves. In the past, Protea nitida Mill. was also known as P. arborea Houtt. and P. grandiflora Thunb. 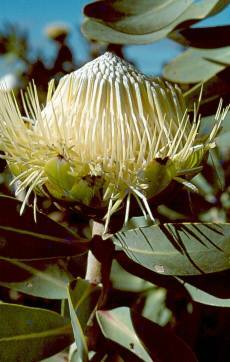 The Proteaceae is an ancient family and existed in the time of the dinosaurs. It comprises about 1600 species in some 77 genera and is largely confined to southern hemisphere countries. With 45 genera Australia has the most representatives, followed by Africa with 14 genera. In the southwestern Cape alone, more than 330 species of the family have been recorded. Other countries where Proteaceae occur include Central and South America, islands east of New Guinea, New Caledonia, Madagascar, southeast Asia, New Guinea and New Zealand. 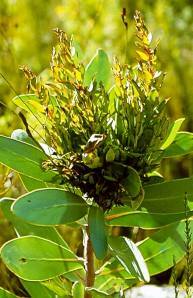 The waboom forms part of South Africas fynbos vegetation and lives up to expectations with its adaptations to fire. The tree-like forms are protected by an exceptionally thick layer of bark. Plants of the small form will survive fire by resprouting from an underground bole. Seeds are stored on the plant in seedheads; once they dry out they release the seeds which are dispersed by wind. Flowers are pollinated by birds. Proteaceae sport proteoid roots which serve to enlarge the surface area for absorption of nutrients and water from the soil through many hair-like structures. No symbiotic relationship is known and it is thought that these proteoid roots do not allow mycorrhiza to form. Witch's broom is a disease or deformity where the natural structure of the plant is changed. A mass of shoots grow from a single point, with the resulting structure resembling a broom. In the past superstitious events were blamed on witchcraft and the broom-like appearance of this disease has led to its common name. Witch's broom growth may last several years and can be caused by fungi, insects, mistletoe, mites, nematodes, viruses or environmental factors such as pruning. 41 Protea species, including P. nitida, are recorded to be susceptible to witch's broom. Protea nitida has various common names relating to its historical uses. Baboons would climb up the trees to feed on the nectar of the flowers, or baboon sentries would use trees as lookouts, and therefore the plant was given the name bobbejaansuikerbos. Brandhout, the Afrikaans word for firewood, indicates another use. The name waboom originates from the use of the wood for wheel rims and brake blocks of wagons. Interestingly, the name waboom was first recorded in 1720 and has thus been used for far longer than its scientific name. The wood was popular for the manufacture of ornamental furniture. It also made excellent charcoal. The bark was used for tanning leather. The tannin-rich bark was used to prepare an infusion for treating diarrhoea. The leaves were used for making ink. Either dry or fresh leaves were boiled up with a rusty iron nail and a piece of sugar candy. The resulting fluid (a decoction) is a fine blue-black, ideal for dyeing. These days, however, the greatest use for P. nitida is as a garden specimen. Propagation can be done by means of cuttings or seed, seed being the easiest. Sow seed in June. Seed requires warm day and cold night temperatures to germinate. Prepare seed trays containing a well drained mix of bark and fynbos soil (50:50 mix). Scatter seed on top and lightly cover with river sand. Water well and use a fungicide treatment. Keep seed trays moist, not wet. Seed germinates usually after about four weeks but this may be delayed for up to a year. When the first true leaves appear, transplant the seedlings into pots in a well drained sandy fynbos mix. Grow on for a year before transplanting into the garden. Take tip cuttings from December to March. Use a rooting hormone and place in a well-drained mix of bark and polyurethane. Cuttings must be kept humid, but not wet. Rooting occurs in approximately five weeks. Harden off rooted cuttings for 3 weeks and then transplant into pots as for seedlings. In the garden P. nitida can be used as a specimen plant or as tall backdrop planting. Planted in conjunction with other fynbos species, such as Restio, Agathosma (buchu) and Erica, it makes a lovely display. It can be used in very large rockeries and open bed plantings. A root pathogen, Phytophthora, is detrimental to Proteaceae. Symptoms include the plant looking wilted and dry, followed by yellowing and death. As these symptoms are only seen once the fungus has damaged the plant, the best course of action is to remove the infected plant and burn it. Thereafter sterilize the affected soil with a contact fungicide and refraining from replanting Proteaceae in that area. Good general plant hygiene and healthy vigorous mother stock will increase the potential of younger plants to remain healthy. Germishuizen,G. & Meyer, N.L. (eds). 2003. Plants of southern Africa. Strelitzia 14. National Botanical Institute, Pretoria. Mabberley, D.J. 1997. The plant-book, 2nd edition. Cambridge University Press, Cambridge. Rebelo, T. 1995. Proteas A field guide to the Proteas of Southern Africa, 2nd edition. Fernwood Press, Vlaeberg. Rourke, J.P. 1980. The Proteas of Southern Africa. Purnell, Cape Town, Johannesburg, London. Rousseau, F. 1970. The Proteaceae of Southern Africa. Purnell & Sons, Cape Town. Stearn, W.T. 1966. Botanical Latin, 4th edition. Timber Press, U.S.A.
Stearn, W.T. 1992. Stearn's dictionary of plant names for gardeners. Timber Press, U.S.A.
Williams, I. & Codd, L.E. Flowering Plants of Africa 39: pl. 1527.